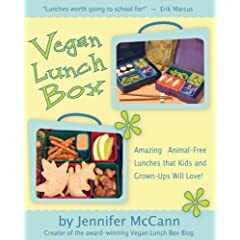 Jennifer McCann's Vegan Lunch Box is one of my favorite food blogs. McCann's recipes are creative, fun, and most importantly, taste good and are healthy alternatives to fast food. Her book, Vegan Lunch Box is filled with these healthy recipes, as well as tips for living the vegan life.The recipes are geared at both adults and children, and offer great suggestions to spice up your meals. A menu note: this essay goes well with Neal Pollack's Book Notes contribution for Alternadad and Isa Chandra Moskowitz's submission for Vegan with a Vengeance. When I think of Vegan Lunch Box blog and the book it inspired, I think of happy, cheerful, kid-friendly times. That's what I wanted to share with my playlist: a feeling of fun, with children underfoot and equal parts cooking and dancing going on the kitchen. 1. Peanut Butter and Jam, Charity Khan. This is where it all begins and sometimes ends with school lunch: a nut butter and jam sandwich in a little plastic zipper bag, an apple, and some carrot sticks. Ah, it's practically all I ate for lunch my first year after going vegetarian. Nice as it was at times, I dreamed of better things for the next generation. I'm here to tell you now, there's more to lunch than good ol' pb & j. 2. Pure Imagination, Michael Feinstein. Here's a song from my all-time favorite food fantasy movie scene as a child. As Willie Wonka said, "Ladies and Gentlemen, the Chocolate Room." I am so there. It was only just now as I listened to the song I noticed the lyrics, "Want to change the world/There's nothing to it". That makes it even sweeter to me. I like to think that I've helped in my own tiny way, sharing cruelty-free lunch ideas using lots of pure imagination. And chocolate. This perfectly conveys the kind of music I like to have in the kitchen when I'm cooking and making my lunch boxes: happy, bouncy, make-you-smile music. 4. Tchavolo Swing, Hot Club of San Francisco. More happy, bouncy music. This is the CD I often put on when my little niece comes to visit. We dance around the house and jump on the trampoline, then nibble on her beloved "baby apples" (grapes). 5. Mocca Swing, Quadro Nuevo. I hesitated to add this track, as I'm so positively sick of it. This is my son's favorite CD, and he listens to this song over and over and over. Every child goes on food, story, or music jags at some point. I get anxious emails from moms who say their son or daughter won't eat anything but pizza and baby carrots. I say, throw as many good foods as you can on to pizza crusts and wait for the day (and it will come!) when something new catches their eye. If it's a music or storybook jag, though, feel free to hide it under the couch. 6 & 7. James K. Polk and Why Does The Sun Shine?, They Might Be Giants. These songs are like my lunches, tasty but good for you! Most lunch boxes end up at school, so it's time for a lesson or two. Besides, no kid-friendly playlist in my house gets very far without some TMBG thrown in. I especially like the catchiness of both these tunes. Although I can't always remember what I walked into a room to do, I will forever know all about the elections of 1844 and why the sun shines. 8. The Veggie Song (Go, Go, Go), SteveSongs. One day my son brought vegan fondue to school in a warm thermos, along with a lunch box filled with vegetables like carrots, cauliflower, green beans, new potatoes, and Brussels sprouts for dipping. He was having so much fun dipping them and slurping them up that the excitement got contagious. Soon two more kids came over and started telling me all about which vegetables they really liked. "I could eat a bowl *this big* filled with peas!" one girl bragged. Hooray, vegetables are good for you! Oh, we love SteveSongs. My son is definitely faster than a fast monkey, especially after eating his vegetables. 10. Singing In The Bathtub, R. Crumb and his Cheap Suit Serenaders. .
Time to scoop up the nearest toddler and dance while the vegan Twinkies are in the oven. Better yet, give them a bubble bath. 11. I Want a Girl Just Like The Girl That Married Dear Old Dad, Memphis Jazz Orchestra. Finally, this one's for all the blog readers who ask me if I'll adopt them, be their mom, and pack their lunches for them.